In the past, homeowners had little choice about the type of insulation they could use for their homes. While fiberglass was the most commonly used form of insulation, there are now several options. 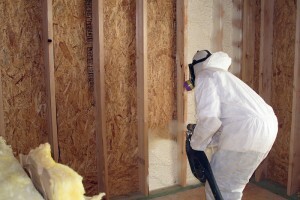 Today, more and more builders are choosing to insulate their homes with spray foam. Traditional fiberglass insulation cannot stop all the air from seeping through. In fact, about 30% of your heated or cooled air can escape your home if it’s insulated with fiberglass. Spray foam insulation fills all the nooks and crannies within your walls, which makes it highly efficient in preventing air loss. When air escapes from your home, your heating and cooling system works overtime to maintain a comfortable temperature, which means higher energy bills. Since spray foam insulation prevents air from escaping your home, you have more control over heating and cooling costs. The R-value of insulation refers to its resistance to heat flow. High R-values can prevent more heat from escaping your home. Typically, an R-value of about 38 is required for most homes. While the R-value of foam spray is six per inch, fiberglass is only about 2.2 per inch. What this means is that you’ll need more fiberglass to meet the required 38 R-value. In the end, you will end up spending more. When you choose to install spray foam insulation in your home, there are no harmful particles released into the air. Furthermore, spray foam does not retain moisture, nor encourage mold and mildew growth. Spray foam lasts longer, has great coverage and is environmentally friendly. For more information on spray foam insulation or to get a recommendation on the best type to use for your home or business, contact USI online to find a branch near you and get a free quote. USI believes that excellence in every step of the process and ensures timely completion and quality of service, time after time.